From the 7th of January the Sales Office of the Rezydencja Chrobrego project will be closed. A visit possible after appointment. We’ll be happy to help you at the our nearest Sales Office at Włodarzewska 83 St.
Rezydencja Chrobrego ideally blends into Stare Włochy. It was designed bearing in mind the history of the area and how it functions in the present day, and also using state-of-the-art technology to make everyday life easier. This three-storey building is C-shaped. The bright and modern exterior is contrasted with colourful elements. With regularly arranged windows and framed glazing the building has a modern villa style look. We enter Rezydencja Chrobrego through a distinguished, interior courtyard. The common areas are spacious and comfortably convenient. They were built only with the highest quality of materials. The building has a single-level underground garage which can be accessed from the residential floors via one of the modern elevators. It will accommodate 99 vehicles. Part of the space on the ground floor of Rezydencja Chrobrego will be designated as retail space. The area around the building will be planted with greenery and adapted for leisure and fun. Rezydencja Chrobrego is located in the very heart of Stare Włochy, a peaceful area demarcated by Sklepowa, Chrobrego and Szczera Streets. Chrobrego Street is surrounded by three vast green areas, ideal for walks. Two large parks are situated in the vicinity – Park ze Stawami Cietrzewia and Park Kombatantów with a historic small palace where a public library is located; Staw Koziorożca is also located nearby. Both parks have vast water reservoirs, enjoyed in particular by nature and sports enthusiasts, families having picnics or anglers. Children can have a lot of fun on brand new playgrounds which can be found in both parks. In addition, Park ze Stawami Cietrzewia features a public outdoor gym. Fort Włochy is an equally attractive green area alternative. At the moment, the park is under revitalisation, but will ultimately include an open-air military museum, sports fields, tennis courts and other leisure areas. There is also a local sports club in the vicinity, Klub Sportowy “Przyszłość”, with its own sports fields and tennis courts. Warszawa Włochy Railway station 4 min. Włochy Community Centre 1 min. Blue City shopping centre 7 min. Reduta shopping centre 11 min. Skorosze shopping centre 6 min. Park Kombatantów and Park ze Stawami Cietrzewia 5 min. Włochy leisure complex 13 min. Centre of Warsaw 22 min. Szczęśliwicki Park, Szczęśliwice Centre - ski slope 26 min. The location of Rezydencja Chrobrego is ideal for accessing all of the big city amenities. You can find shops, restaurants, pharmacies and service outlets nearby, including the largest outlet in Warsaw – Factory Ursus. There are many nurseries and schools in the neighbourhood, and just on the other side of Chrobrego Street there is a thriving community centre, Dom Kultury “Włochy”. Office buildings along Aleje Jerozolimskie, including offices of global corporations such as Microsoft, Avon, Philips, Orange or Mercedes-Benz are just steps away. automation solution available on the market. 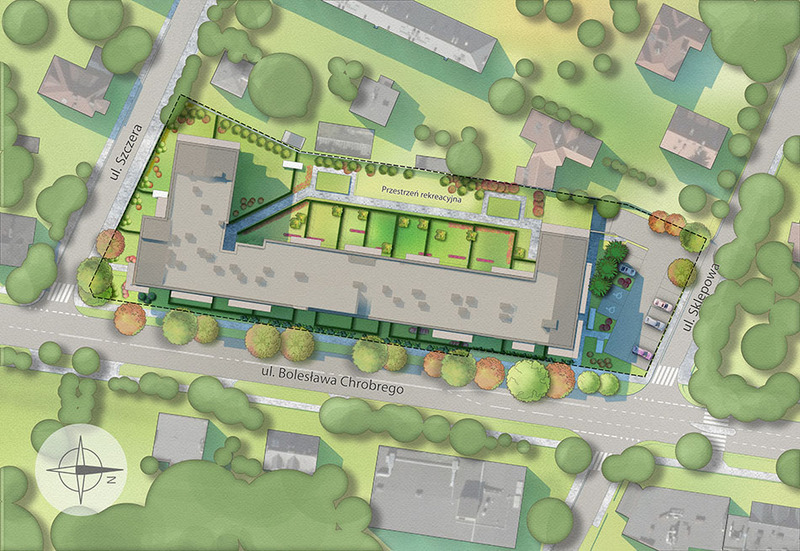 The "Rezydencja Chrobrego" project, including the building, utility space around it as well as the surroundings have been designed in such a way as to provide the residents with maximum comfort of use. 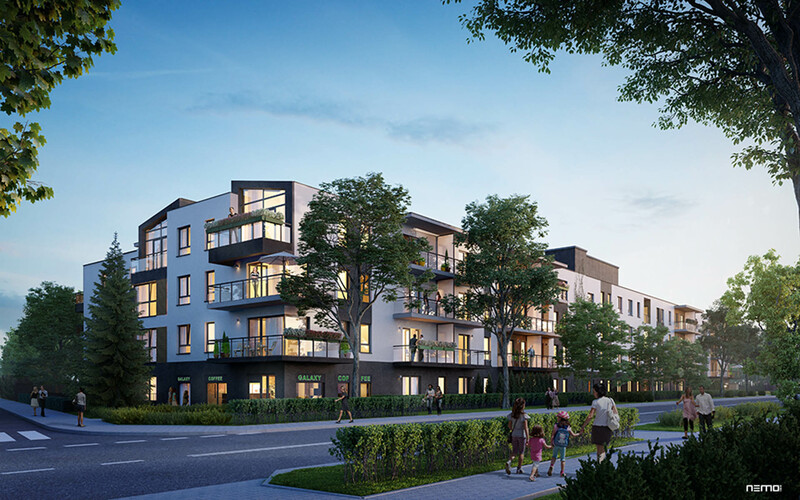 This is the first residential area in the district of Włochy certified under the BREEAM system. of the Rezydencja Chrobrego project will be closed.